Does Maine Gov. LePage Advocate Shooting Drug Dealers? Does LePage Advocate Shooting Drug Dealers? 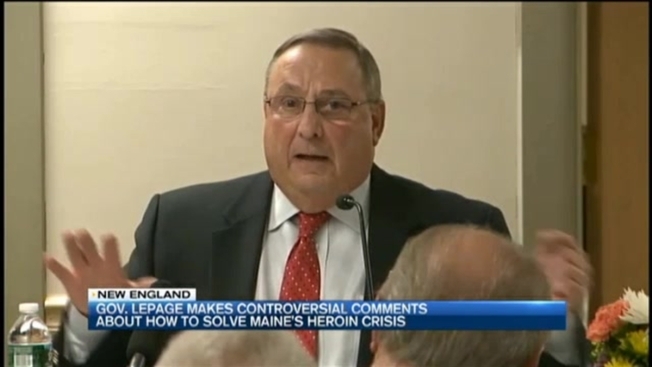 Maine Governor Paul LePage has made another controversial comment about drug dealers. This time, he is suggesting vigilante justice could curb Maine's heroin epidemic. "Everybody in Maine, we have constitutional carry," said Gov. LePage. "Load up, and get rid of the drug dealers." LePage was addressing the media after an appearance in Lewiston. When asked about a recent remark to a radio station that the state should bring back the guillotine to execute drug dealers, he said he was joking. "I'm French, and I'm a history buff," he said. But LePage said he is serious about increasing the penalty for trafficking drugs into Maine. "If we can trace the drug to the dealer, I'd like to make it a homicide," he said. "I get depressed seeing five people a week dying, and three babies are being born a day addicted to drugs." A few weeks ago, LePage apologized for a comment he made about drug dealers he called "D-Money, Smoothie, and Shifty" coming to Maine and impregnating white women. He said he meant to say "Maine women" instead of "white women."